The story of how a famous tagline came to be. A 1970s artifact from the brand archives, this snowmobile helmet showcases the iconic John Deere tagline on early snow gear products. As winter fades away for the beginning of spring in the northern hemisphere, folks who enjoy the pastime of snowmobiling will be packing away their gear until the snow flies again. Their machines will be properly stowed and snowmobile suits and helmets will be placed on a shelf or in a closet for safekeeping. Perhaps unnoticed by their owners, a few of those helmets will mark a special 40th anniversary next season. From its 1971 launch, the iconic slogan was used to demonstrate Deere's commitment to excellence. 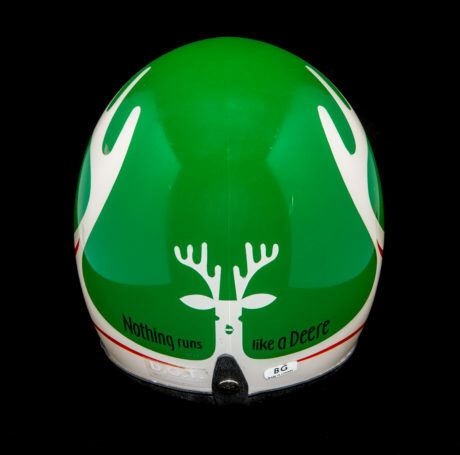 In 1978, Deere first allowed its now famous “Nothing Runs Like a Deere” tagline to be placed on snowmobile helmets as one of the first licensed products to carry what had been seen until then only in advertising materials. It was natural for the tagline to be affiliated with snowmobile gear because it was first conceived as an advertising slogan for the snowmobile line that Deere launched in 1971. The book “The John Deere Way” provides some background as it explains the first snowmobile advertisement ever published contained a never-before-used company slogan. Early 1980s advertisement for John Deere snowmobiles. The tagline almost never came to light, according to Neil Dahlstrom, John Deere’s manager of corporate archives and history. Bob Wright was a copywriter for an outside advertising agency working on the snowmobile line, Dahlstrom said, when Wright first drafted the slogan. The idea was discarded before it was shown to Deere but Wright decided to grab the crumpled paper and keep the idea in case it was needed. “The John Deere Way” provides more detail through an interview with Ralph Hughes, who was an advertising manager for John Deere at the time, and retired as the company’s marketing director after 38 years. He said research showed a market for snowmobiles among people who were already customers of John Deere’s farm and lawn equipment. Hughes said in the book that Wright and the team from the ad agency had a good laugh about the “Nothing Runs Like a Deere” line but thought it too silly to present to the company. However, when it was eventually revealed, Deere’s advertising team immediately liked the concept. It remained the backbone of the marketing effort for the snowmobile line from 1971 until 1974. The tagline returned in 1978 when Deere began using it again and also allowed it to be placed on snowmobile gear including the helmet. Deere stopped manufacturing snowmobiles in 1982 but the tagline did not die. 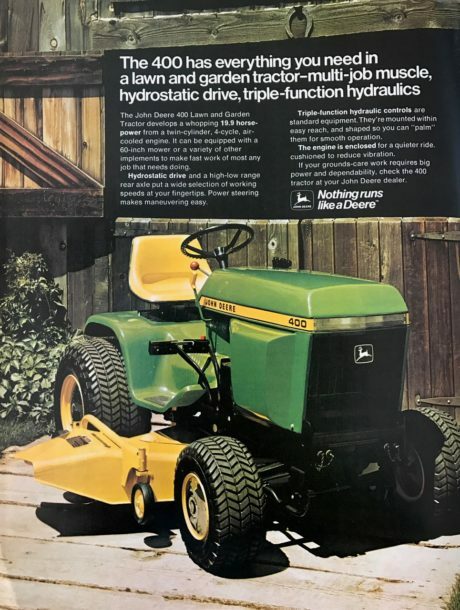 When Deere stopped making snowmobiles, the “Nothing Runs Like a Deere” tagline was used to market lawn equipment only before later being adopted by the entire company. According to Tim O’Connor, retired brand manager for John Deere, “Nothing Runs Like a Deere” gained even more momentum when the tagline was determined relevant in promoting broader activities of the company, not just its products. Dahlstrom says he still hears from people who own a John Deere snowmobile, helmet or other gear used in the sport. These occasions will be less frequent as time passes but the legacy they helped inspire will carry on as “Nothing Runs Like a Deere” continues as a legendary tagline for the 180-year-old John Deere brand.